Only Muslims Can Defeat Muslims? 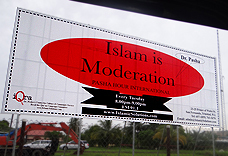 Dr. Pasha has repeatedly pointed out how only Muslims can defeat Muslims. That seems to be the Muslim story — forever. Use that model to interpret the events in the world today — or at any time in the past — and it’s amazing how the model fits every time and how clear things become. But it seems that the large majority of Muslims just couldn’t care less about the world. They are consumed by their own passions and preoccupations — sports, entertainment, business, whatever else.